I had a busy weekend, but still managed to come up with two new recipes. This one was Sunday's lunch, and it really hit the spot. 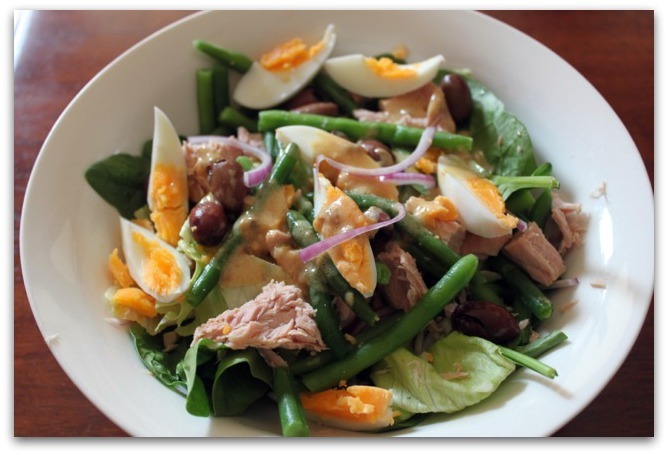 My version of a Nicoise salad. Recipe's up over at Fitbodies Food; go have a look-see. Since we're almost two months into the year (where did THAT time go? ), I thought I do an update on where I'm at with my goals. I've had a BIG training week this week, and I'm feeling pretty pleased with myself. I love my newish and still novel weights program and I'm feeling the love after each session. Oh wait....that's not love, that's just DOMS. Hehe. Strength is returning in leaps and bounds. I don't know whether I'll ever match or exceed previous personal records on anything, but I don't much care. I'm more interested in getting the results I want than in how much I can lift. My cardio fitness has improved a lot, so I've given those workouts a really good hammering too. Even though cardio is not my favourite thing, I do begin to enjoy it when I can actually DO it. (Who knew?) I'm doing a little running, but being very cautious with it. When you have a significant leg length discrepancy, your muscles do all kinds of funky things to compensate, and I know now that I'm very prone to ITB/glute medius problems among other things, as well as my life-long sacro-iliac joint pain. I'm not about to create new and interesting injuries by trying to be a hero. It's not about impressing anyone, after all. My lower half requires a bit of dedication to some exercises to activate my lazy muscles and un-kink my over-active ones. It's a constant challenge to fit this stuff in, but if I don't, I pay the price in terms of pain and training setbacks. It's poured rain all night here - which is very welcome after a blisteringly hot weekend. The garden was looking parched and our tank was empty (and boy, do I hate having to pay for the water we flush down the toilets! ), so I'm not complaining about the wet. But I bet things are going to be pretty ugly out on the roads this morning. Take care, if you're driving in Melbourne today - or anywhere else that it's wet, wet, wet.